We live in a time when social networks such as Facebook, Twitter, Google+, LinkedIn, and Pinterest not only connect us, but have become an integral part of our digital lifestyle. In addition, tools such as Klout, Kred, and the newly-released Finfluencer are providing us with new ways to measure our digital activity, influencing and contributing to our stature within each network. Using new big data analysis technologies, it is now possible to track and measure our behaviour trails across almost any part of our digital footprint. Everything we do, say, see, or share online is available for all to see, creating a path of data. Now, a newly-released tool and microsite called Finfluencer aims to take it to the next level – helping us to measure our financial influence. Kosta Peric, former Head of Innovation of SWIFT, founder of Innotribe and now the Deputy Director of the Financial Services For The Poor of the Bill and Melinda Gates Foundation, highlights that we live in a time when “everything around us is digitised, including ourselves”. Some call this phenomenon the Quantified Self, a movement to incorporate technology into the acquisition of data on aspects of a person’s daily life. 3. We need an accurate gauge, a way to measure digital and financial influence. In a financial landscape where the importance of data measurement and technology is increasing, the ability to measure our personal effectiveness in the digital and social media arena has become something of a Holy Grail. While the algorithms that are used to quantify online influence are in their infancy, the existence of projects such as Klout, Kred, and now Finfluencer shows that the demand for this is growing, and will continue to grow as the Attention Economy expands. 4. We all have influence but the challenge is measuring it correctly. If there’s one thing that these new online tools can tell us it’s this: Each and every one of us has influence online – regardless of our economic status or geographical location. Once again, internet technology has levelled the playing field – or at least tipped the balance somewhat. Now that social media is firmly embedded in the DNA of the internet, each of us have the power to change the conversation, to add our own unique insights and input. However we choose to measure it, the value of our online influence cannot be denied, nor can the power it holds in a world that is increasingly dominated by digital technologies. 5. How can you find out how influential you really are where it counts? Forget the era of “how many followers do you have?” – Klout scores are where it’s at these days. Measuring influence across the whole digital spectrum rather than just an arbitrary number of followers can be very revealing, but realistically, how can you find out how influential you really are where it counts? We all want to know where we stand in the global conversation, but what about within our own industry. Isn’t that where it matters most? In an age when you’re competing with billions of other online users, all trying to be heard, it’s time to get niche – it’s time to say hello to Finfluencer.com. Finfluencer.com is a brand new microsite / tool launched by Transamerica that works hand in hand with Twitter. Essentially it’s a Klout that measures online financial influence. Thanks to their custom algorithm, your online influence can now be measured specifically within the financial services sector, giving you a better idea of where you stand within your own sphere of influence – and where users you follow stand too. 7. Are you a Finfluencer? Transamerica’s official description of a Finfluencer is “One who, or that which, influences financial services discussions”. Sound like you? Want to know how it works? Then crunches the data and produces a score to let you know just how financial influencial – or “Finfluential” – you are. 9. But how does Finfluencer really work? Finfluencer’s unique custom-designed algorithm allows it to track and analyse keywords in tweets that relate to financial services topics. It also takes into account a Twitter user’s followers as well as the people the user follows. It then compares a user’s score against the top financial Twitter contributors to determine a final “Finfluential” measurement score. The topic of “financial services” is the second most discussed subject on Twitter with 1.5 million mentions per day. With a discussion field this vast it’s hard to gauge just how influential your tweets are on Twitter, so Finfluencer aims to make that easier. 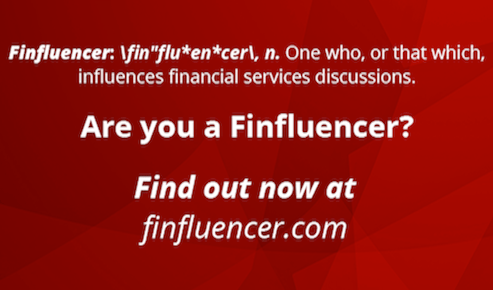 As well as helping you to figure out where you stand in the financial Twittersphere, Finfluencer scores can help you reach out to those that count. With so many users online, Finfluencer scores can also make it easier for you to figure out who you should follow, and who can provide you with the most valuable information out there in Twitterworld – in essence, helping you to sort the wheat from the chaff. For bloggers and those promoting the online discussion of all things finance it’s a useful tool to help them compare their scores with others. According to Transamerica, the new microsite is targeted specifically at financial bloggers, financial services professionals, as well as anyone who just simply enjoys sharing their thoughts on a range of financial topics. In the long run, the microsite aims to highlight who the top contributors are in the financial space, helping us all to identify who the real movers, shakers and forward-thinkers are. It’ll also help us all to measure our impact on the ongoing conversation. 11. So what’s a good score? All you need to do to find out your current tally is to log on to Finfluencer.com and allow Finfluencer to connect with your Twitter account. The only thing they ask is that you become a follower of Transamerica. Providing you don’t mind sharing your basic Twitter info with the microsite, you’re ready to go – and it’s completely free. Obviously, with the algorithm being based on the number of tweets you put out there containing financially pertinent keywords, it pays to tweet frequently, and on topic too. So it can act as a real motivator, encouraging us to do what we should be doing in the first place – sharing our thoughts, helping each other to think and learn, and connecting as users with a real interest in the financial services conversation. As your Finfluential score is also based on the number and type of followers you have, and the users you follow, you can up that score by increasing your follower base too. 14. Just how accurate is it? Of course, no algorithm can perfectly measure anything as complex as ‘influence’, something that is constantly changing, especially in a world as fast-paced as the financial sector. It’s all relative. Warren Buffett might suddenly start tweeting solely about his golf handicap or his love of gardening, so his Finfluential score might drop. But given that he’s followed by just about every financial name under the sun, it’s unlikely to drop below a certain threshold. Essentially, it’s weights and balances, and really should just be taken as a general overview as to what kind of strata you’re on, financially speaking. Finding out where you stand can serve as a genuine motivator too, encouraging you to climb higher and connect more. The brains behind Finfluencer are Transamerica, and the project is powered by Juiceboxd. Through its subsidiary and affiliated companies in the Americas, it’s one of the leading providers of life insurance, retirement, long-term savings and investment solutions worldwide. Its companies in the United States trace their roots back over 100 years, and while operating throughout the US, they’re headquartered in the main in Cedar Rapids, Iowa, and Baltimore, Maryland. 16. 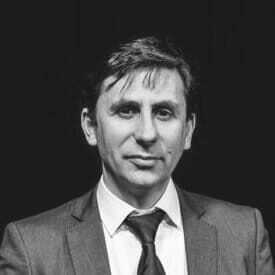 Is Finfluence set to grow? At the moment, Finfluence only connects with Twitter. In the near future Transamerica intends to let us know exactly who the most financially-influential Twitter users are – and more. They don’t intend to limit their scope to just Twitter, with LinkedIn and other social sites like Facebook being considered for further Finfluential score keeping too – basically anywhere that financial discussion can take place online is an area that Finfluence could potentially analyse. In future we’ll essentially have a full-blown score to measure for the financial sphere, and with Klout launching its own Klout for Business last year, surely only more niche Klout score-keepers can follow suit. 17. 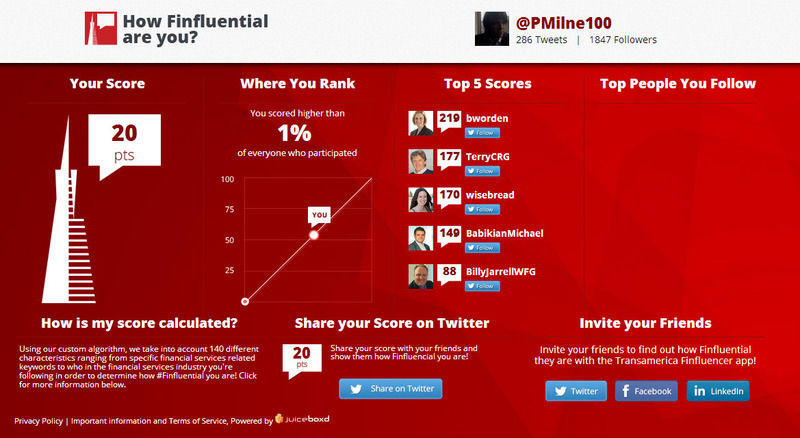 How does Finfluencer compares with Klout? If Klout’s opaque algorithm has earned the world’s leading influence-gauger some criticism, then the same criticisms are sure to be fired at Finfluencer too. At the moment restricted solely to the Twittersphere, it is starting its first steps and of course it can’t be compared with Klout’s far more wide-reaching spread – measuring influence across more than 20 social platforms. Twitter is a start, but Finluencer knows that it simply can’t create meaningful scores when limited to just one social network – the financial discussion online extends far beyond the reach of just Twitter these days. But it is a great beginning, as financial influence is a key metric in a time of crowd-funding, emerging alternative finance and new digital currencies. 18. How important are followers for Finfluencer ? Finfluencer also differs from Klout in that it takes into account one thing that Klout expressly ignores – the number (and type) of followers you have. Klout discounts this as a measure of influence, preferring to measure what proportion of the content you create is acted upon and how influential the people that are performing the actions. Finfluencer counts this as an important factor, but not the main one. 19: Measuring influence and financial influence. 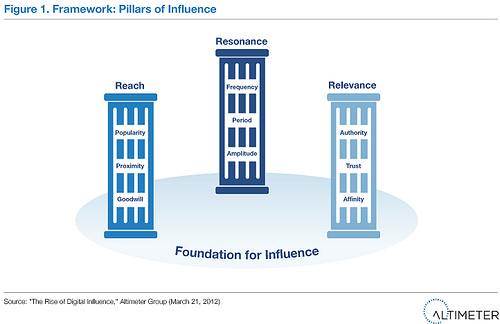 These differences in influence-gauging raise interesting questions as to just what constitutes influence today. How can it be measured in the online sphere? Is someone with a high number of followers instantly more influential? What if none of your million followers acts upon the content you create and share? What makes someone truly a trust agent, a digital or social media influencer in the complex and multi-layered world of finance? Bearing in mind that Finfluencer has just started, it is rather a bright newcomer – one that opens doors for technology to disrupt the old and sometimes nebulous world of finance. In a sector where trust has been eroded considerably in recent years, technologies such as these will play an increasingly important role in shaping the financial services industry in the years to come.